There are some amazing future artists and scientists in Fife! Before Christmas, Commercial Primary School’s Primary 4 teachers, Karren Aitken and Adele Lang, and Saline Primary School’s Primary 3/4 teacher, Gillian Hanlin, kindly hosted a Dunfermline Gilbert and Sullivan hands-on “Colour and Fizz” chemistry workshop, introducing The Sorcerer. 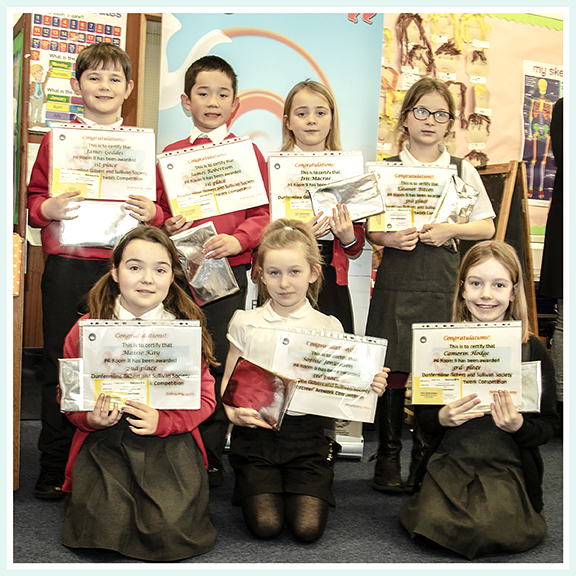 We also ran an art competition for Primary 4 at Commercial Primary School, and the happy prize-winners are shown above. You’ll find a list of them and more information and pictures at this link. The winning pictures will be displayed in the Carnegie Hall foyer during next week’s run of The Sorcerer (21–23 February). Hopefully, there will also be room to display a few more of the other amazing Primary 4 pictures.